Rangemaster are bringing you this fantastic offer between 14th January 2019 and 31st March 2019. 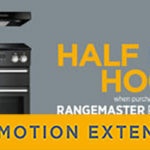 Get a Rangemaster Cooker Hood for half price when you buy a Rangemaster Range Cooker! Choose one of the hood below? Use RET101 at the checkout and receive a 50% discount of your hood. While we are proud of our history we would not be Britain's No.1 range cooker brand today if we did not continue to offer the right mix of quality, performance, choice, features and design that make Rangemaster cookers such great value. That's why you will find us in more homes than any other range cooker brand. All of our range cookers come with a two year warranty, which you are able to extend if you wish to. Behind that warranty sits a host of internationally recognised standards and strict quality controls that are in place at every stage during design, development and manufacture. Our products are built to stand the test of time, with everyday use in mind, Rangemaster range cookers are made from the highest quality materials to ensure longevity and durability. Alexandra Dibble, our Home Economist, plays a vital role at Rangemaster. She ensures that our products are designed to deliver on the cooking expectations of Rangemaster customers. So whether you cook daily for a large family, are a keen home baker, have a passion for Asian cooking or are simply a food fanatic you will not be disappointed with your Rangemaster cooker. We are proud to say that all of our 90, 100 and 110 range cookers are manufactured at our British manufacturing plant, in Royal Leamington Spa, where the very first range cooker was built back in 1830. Over the years our cookers have won many awards. Our Kitchener won one of only 19 gold medals awarded at the Great Exhibition of 1851 where it was chosen out of over 30,000 exhibitors. More recently our Professional+ 90 was voted the best buy cooker by Which? magazine in their range cooker review. We were also recently awarded Best Range Cooker of the Year 2015 in the prestigious German Plus X Awards for the Most Innovative Brands. Rangemaster is the world's oldest range cooker manufacturer. The very first range cooker, the Kitchener, was invented and built on the same site as our current factory in 1830 and revolutionised how people cooked. 187 years later we still manufacture all of our 90, 100 and 110 range cookers in Royal Leamington Spa and are immensely proud of our long and rich heritage. As well as inventing the world's first cooker, Rangemaster are part of AGA Rangemaster Group, a group which is home to the world's most aspirational range cooking brands including AGA, Rayburn, Falcon, Mercury and La Cornue. Consequently our expertise in range cooking is second to none and that means we are always focused on ensuring every one of our cookers is manufactured to exacting standards. We are probably best known for our range cookers but we also specialise in a wide range of other kitchen appliances. Have you see our new range of single ovens? Free fresh fruit & veg from Veg In A box!